This song book contains a selection of songs that have been re-written to give them Red Hatter themed lyrics. The original song name is in brackets, to let you know the tune of the song. This songbook was created using songs that have been passed around online. No authors are known for these songs, and it is being shared here in the spirit of fun and sharing of resources. This songbook was created in A4 size, so printing to that size will give you 12 pages of large text to make it easier to read. Or you can select to print it as a smaller (handbag size) A5 size booklet (instructions below). It is always best to do a test printing with a low quality setting in black and white – to test everything works before you use your coloured ink. Just in case it doesn’t work out as planned, so you don’t waste your printer ink. Some printers have an inbuilt option for automatically printing on the back and front of a piece of paper. My printer does not do that, so I can only give instructions on how I know to do it – using a printer where you need to manually put the paper back in to print the other side. 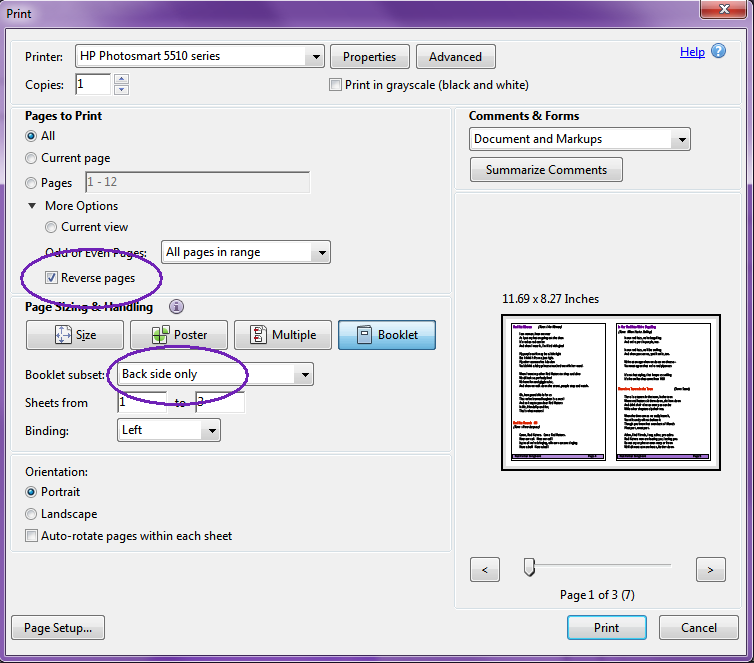 To print as an A5 Booklet, open the file in Adobe reader and select the print option. 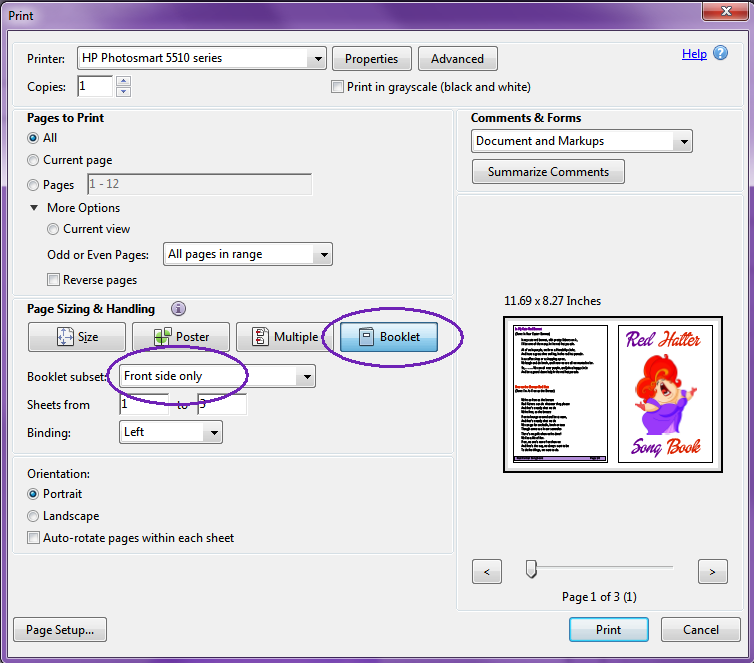 Select the “booklet” option and make sure it is set to print the front side and all 3 pages. The click print. Once those pages have printed. Place them back in your printer* and select to print the document again. This time select to print the back side only, and depending on how your printer works (if it prints the last page first), you may need to tick the “reverse pages” option. * Please note that different printers work differently in how the paper feeds in and is printed. Some printers will print on the side of the page that faces upwards in the paper tray. Some printers will print on the other side. Some printers will print the last page first. This is why I suggest printing a low-ink (“draft”) test version first. For example my printer is a HP Photosmart, and it prints on the underside of the paper, it also prints the last page first. So to print these booklets I print one side, then I put them back into my printer tray the same way the printer spat them out (printed side up). This then prints the next lot of pages onto the blank side of the already printed pages. Because my printer prints out the last page first, I need to select the “reverse pages” option when doing the second side so that the pages print in the correct order. However your printer may require the blank sides to face up. You may also need to test out which way you put the paper back in again (you may need to rotate it).